A powerful, precise headset – indispensable for our tour guide systems. Our standard tour guide system rental package includes the Beyerdynamic DT 2 stereo headset; the Beyerdynamic DT 1 is also available as an option. 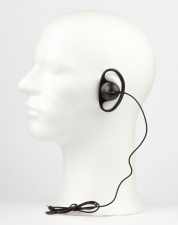 Of course, we stock many other types of headsets for our tour guide systems. The DT 2 and DT 1 are the most popular headsets in the tour guide field, used for a wide range of applications. We regularly receive terrific feedback from tourism industry professionals who rent this headset from us, most often as a package with the Synexis tour guide system's pocket transmitter, the Synexis RP8. The Beyerdynamic DT 1, weighing just 39g on its own, is an ultralight headset; in fact, it's the lightest headset we rent for tour guide systems. Its eight makes it much cooler and more comfortable to wear than heavier/closed headsets. Users appreciate this enhanced comfort, especially on long tours (like city sightseeing tours) or in warm facilities (like the paint shop in auto plants). When used in conjunction with the Synexis RP8 and the appropriate transmitter, the DT 1 headset achieves a sound pressure of up to 85 dB, transmitting the human voice clearly and precisely, even at that volume. The matte black colour is glare-free, so group photos come out flawlessly, even when flash is used. For factory tours (e.g. in assembly plants), racetrack tours, tours in rock 'n' roll venues or wherever else it's noisy, we'll be glad to rent you the perfect headset... from completely closed headphones to noise-cancelling headphones that absorb ambient sounds. One example from our radio equipment rental range: the Helicopter Headset. In short, we'll make sure that your voice comes through loud and clear, even in extreme conditions. Normally, though, either the DT 1 or DT 2 (we recommend the latter) is perfectly sufficient, even in noisy exhibition halls or on factory tours. Like all our tour guide system headsets/headphones, the DT 1 is cleaned, disinfected, tested and shrink-wrapped by our team both before and after each rental... all so that we can ensure that your headset is in tip-top shape when we send it out. We rent these headsets as individual items or as part of a tour guide system. We're very glad to receive orders or inquiries by phone (+49 30 29381970, or toll-free at 0800 11 88 44 0), by e-mail at mail@Radio-Rental.com or by chat.